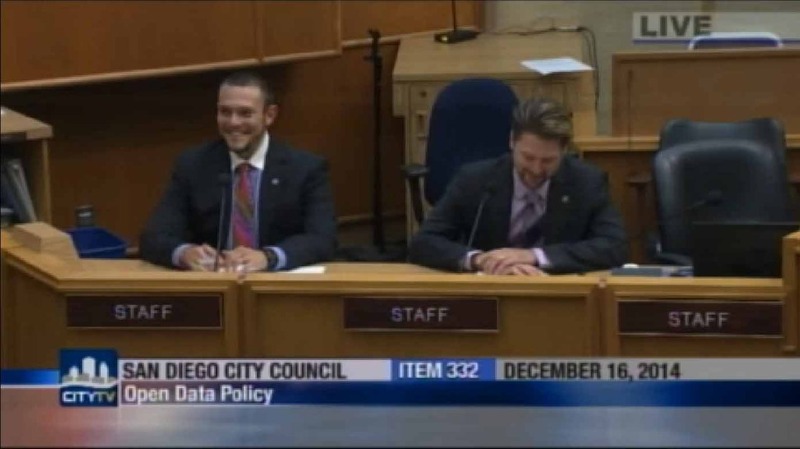 The City Council on Tuesday unanimously passed a policy for open data that will make information about San Diego and the municipal government more readily available to the public. The policy was developed by the city’s Open Data Advisory Group, which is made up of representatives from San Diego’s technology community, the city’s Independent Budget Analyst and employees with the City Council offices of Mark Kersey and Lightner, among others. The city’s recently hired open data officer, Maksim Pecherskiy, told the council that city data is currently scattered, held within closed systems, and needs to be accessed via expensive proprietary software. The idea is to consolidate the information so that it can be put into user-friendly forms, Pecherskiy said. He said an example of a benefit of the policy is that businesses will have data to evaluate when deciding where in the city to open new locations. “This is something that really is going to have a big impact, not only on the local economy in terms of start-ups that are able to take advantage of this vast quantity of data that this city warehouses, but also potentially nonprofits, good-government groups, transparency advocates as well as the city itself — internally,” Kersey said. While an initial inventory of data sets held by various departments could increase the workload on employees, the policy should ultimately ease workloads, increase efficiency and foster more collaboration between city employees, Kersey said. Pecherskiy said the city could begin publishing the data by July 2016. The plan was endorsed by two nonprofit groups — Code for America and Open San Diego.